The plan to build a reservoir south of Lake Okeechobee just needs congressional approval. Yesterday, the Everglades Foundation released a letter it sent to U.S. Senate Majority Leader Mitch McConnell (R-KY) urging him to schedule a vote on the Everglades Reservoir when the Senate reconvenes for legislative business on August 15. The project will accommodate 240,000 acres of dynamic water storage, Eikenberg noted today, cleaning and moving an average of 370,000 acre-feet per year of water from Lake Okeechobee to the Everglades and Florida Bay, significantly reducing Lake Okeechobee discharges, which are the cause of the current algae crisis. Simply text the word “WATER” to 52886, and you’ll be sent to an online form that allows you to easily e-mail your Senators and Representative and urge them to PASS the 2018 Water Bill and BUILD the Everglades Reservoir. Please do it today! I am writing to request that when the Senate returns for legislative business on August 15, you bring to the Senate floor S. 2800, America’s Water Infrastructure Act of 2018, including the biennial Water Resources Development Act authorizing a critical Everglades restoration project known as the Everglades Agricultural Area Reservoir (Everglades Reservoir). The House of Representatives has approved the companion measure, H.R. 8, the Water Resources Development Act of 2018, which includes a placeholder for the reservoir. There is no other way to say this, Leader: Florida is being ravaged by a perennial algae crisis that is destroying our beaches, fisheries, tourism and real estate industries, and we are desperate for the relief afforded in this legislation. For months now, as in previous years, a combination of untreated fertilizer runoff, agricultural and human waste has fueled blue-green algae blooms that now cover at least 40 percent of 730-square mile Lake Okeechobee. When the lake approaches flood stage, billions of gallons of this nutrient- and algae-laden lake water gets discharged into the Caloosahatchee and St. Lucie rivers and the adjoining coastal estuaries. There, the nutrients feed putrid, blue-green guacamole-like goo that kills fish and wildlife alike, sickens humans and as many have observed, smells like death itself. Two years ago, the harmful discharges from Lake Okeechobee and algae outbreaks along both our central coasts forced Governor Rick Scott to declare a State of Emergency that lasted 242 days; this year, an even more serious algae outbreak has forced yet another State of Emergency that is now in its fifth week. plowing tons of dead baitfish, grouper, and tarpon and towing away sea turtles and manatee from beaches that should be teeming with vacationers. The Florida Fish and Wildlife Conservation Commission has logged 287 sea turtle deaths – twice the usual number – since the current bloom began. Eighteen years ago, Leader, you helped enact the Comprehensive Everglades Restoration Plan that policymakers and scientists alike agreed was necessary to save America’s Everglades and, at the same time, solve Florida’s water crisis. A prominent and critical component of the Plan was construction of a dynamic reservoir south of Lake Okeechobee to store and cleanse massive quantities of this algae-causing lake water; instead of being flushed onto our coasts, CERP directs it should be treated and sent south to nurture the Everglades and Florida Bay. Now, after nearly two decades of finger pointing and foot-dragging at both the federal and state levels, we are on the threshold of finally moving this desperately needed project forward. Following the 2016 algae outbreaks, tens of thousands of Floridians made their voices heard in Tallahassee to demand action – anglers, beachgoers, businesspeople, realtors and tourism industry representatives – and the Florida legislature responded, at long last fully funding the state’s 50 percent share of construction of the Everglades Reservoir. Now, it is Washington’s turn. Please, Leader: call up the 2018 Water Resources Development Act to the floor of the Senate for a vote and include within the legislation authorization of the Everglades Reservoir. 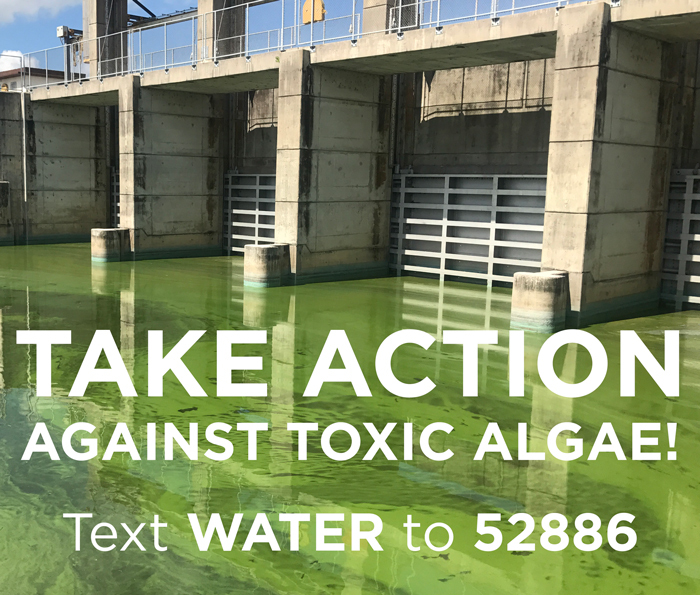 On behalf of Florida’s 20 million citizens and the countless millions of other Americans – many of them from Kentucky – who call our state a second home, I implore you to save Florida from its perennial algae crises. We cannot afford to wait any longer. “We” us Humans are killing our planet.